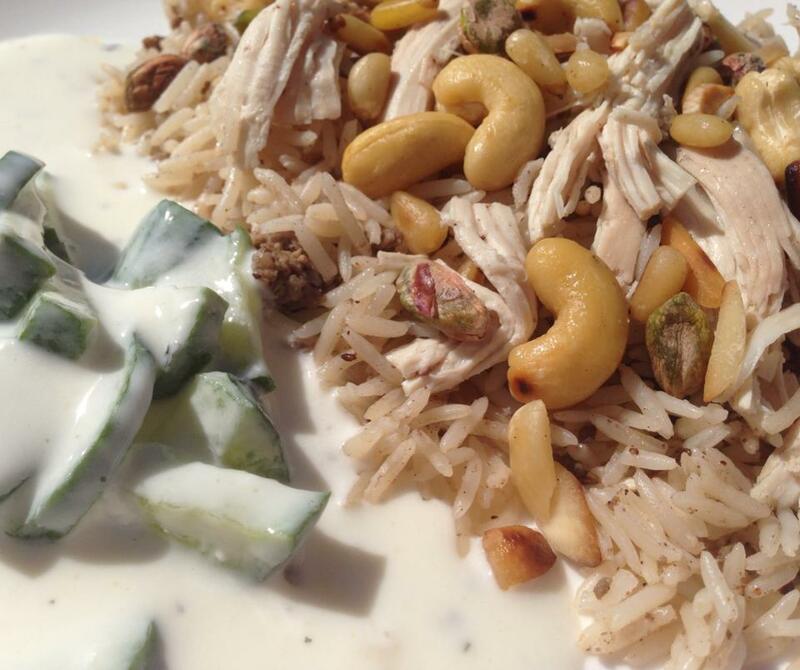 Chicken and rice pilaf with chilled yoghurt and cucumber salad. 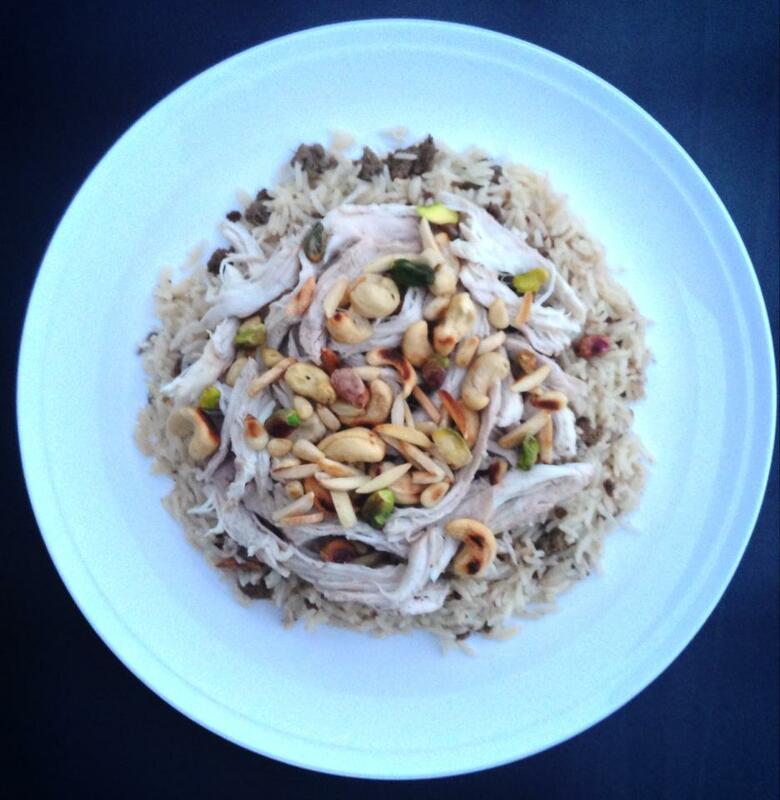 I will be sharing with you today an authentic recipe for a traditional Lebanese rice dish full of aromatic spices. Do not let the word authentic scare you, it is very easy to prepare. Chicken and rice pilaf was traditionally served at feasts and special occasions, and it still is a great dish to serve to large crowds at dinner parties. It is usually served with a chilled yoghurt and cucumber salad which might look more like a soup and is eaten with a spoon. We call it a salad though, and you can most definitely serve it thicker than usual as a side dish to barbecued meats or chicken if you like. 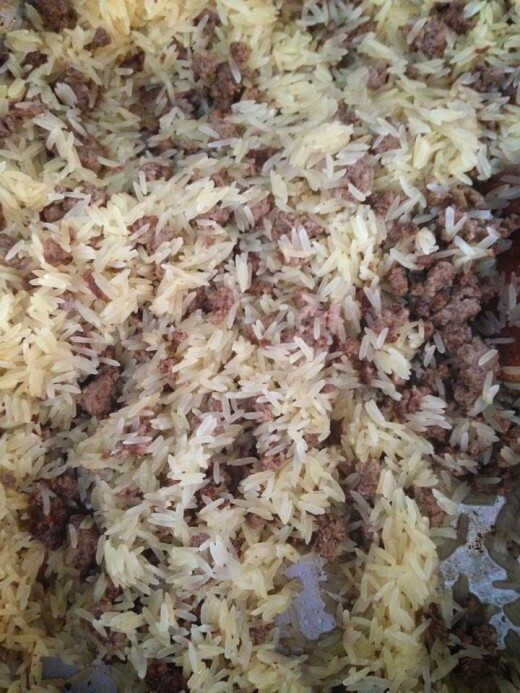 This dish can be prepared ahead of time but do cook the rice about half an hour prior to serving. The spices are essential and the seven spice mix is available at Middle Eastern grocery stores. Please do not use olive oil or any vegetable oil instead of butter or ghee as I have seen in some recipes. A good quality pure ghee or butter is a must. Note: I am using basmati rice which is much lighter than white long grain rice and it cooks much faster. You might need to slightly increase your spices and allow extra time if you are using white rice. Clean chicken and take excess fat off as well as skin. Cut into large pieces and place in pot and cover with water, bring to boil. Skim off the foamy solids that rise to the top, after about 10 minutes there should be no more foam. In the mean time peel and quarter onion and peel and cut carrot into two pieces and add them to the chicken along with the bay leaf, sea salt and the rest of spices listed in chicken broth above. 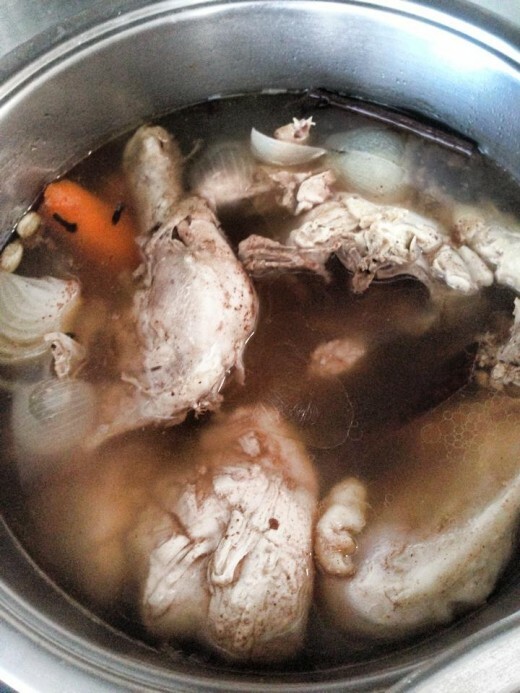 Let it all simmer for about 30-45 minutes until chicken is tender and stock is flavoursome. It is important to add the salt at this stage so the chicken is much more tasty. 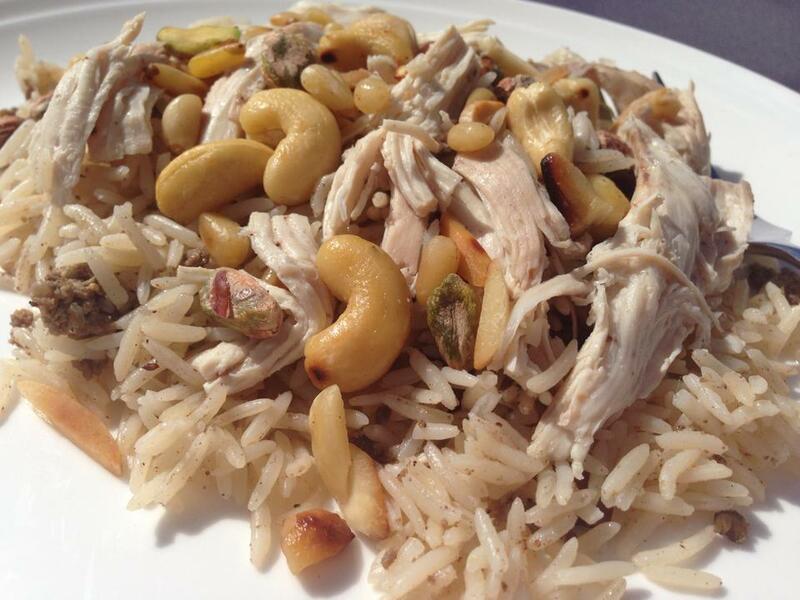 While chicken is cooking, soak the nuts for about ten minutes and then either dry roast them or use a tiny drizzle of olive oil. Pan fry them separately as they each cook at different speed. I usually start with almonds or cashews and leave the pine nuts until last . You do not have to dry roast the pistachios, you can drain them and scatter them on top. Wash the rice several times and set aside. Add ghee or butter to a large wide pot, let it heat then add the mince meat and cinnamon, seven spice and nutmeg. Brown well then add rice and toss well together so the rice absorbs all the spices. When chicken broth is ready, strain 4 cups and add to the rice. Bring to boil then simmer and let the rice cooks for about 15 minutes. Check and make sure all the liquid has been absorbed, then turn heat off and cover with a tea towel and let it rest for about ten minutes. No need to add extra salt because the chicken broth should be salty enough. Remove the chicken from the pot and let it cool a bit, then remove the flesh off the bones and set it aside. If you are preparing the dish ahead of time, it is a good idea to leave some stock aside, and then heat it up and warm the chicken pieces in it prior to serving. You can slice the carrots into thin circles and use as garnish as well. 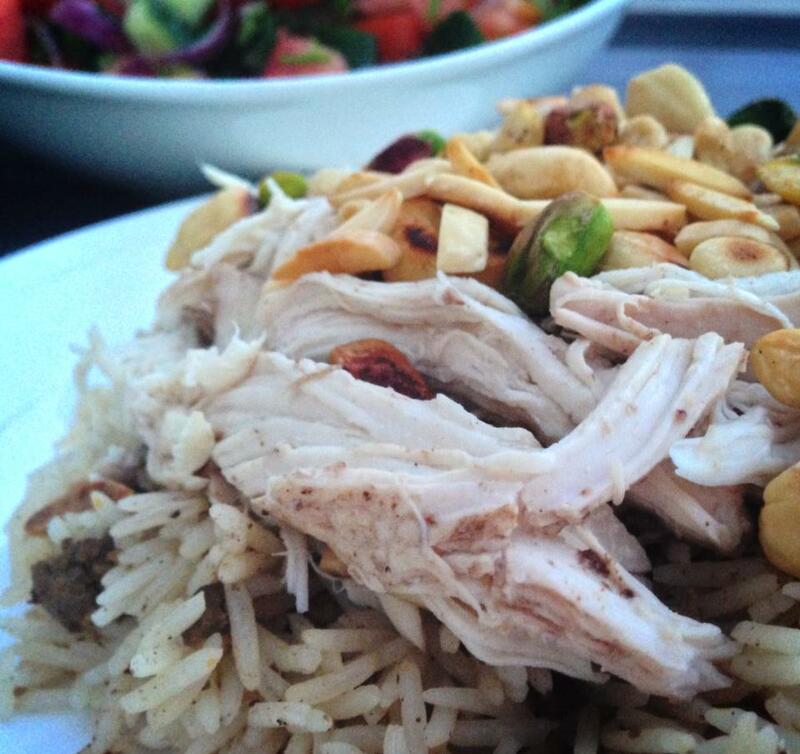 To serve, pour rice mixture into a wide bowl or dish, scatter the chicken meat on top, and then garnish with the nuts and serve with the chilled yoghurt and cucumber salad on the side. Chop cucumber in half lengthwise then slice into thin semi circles. Beat the yoghurt well for a few minutes with an egg-beater until it is smooth and runny, add lemon and enough cold water (depending on how thick is the yoghurt that you are using) until you have a cream like consistency. 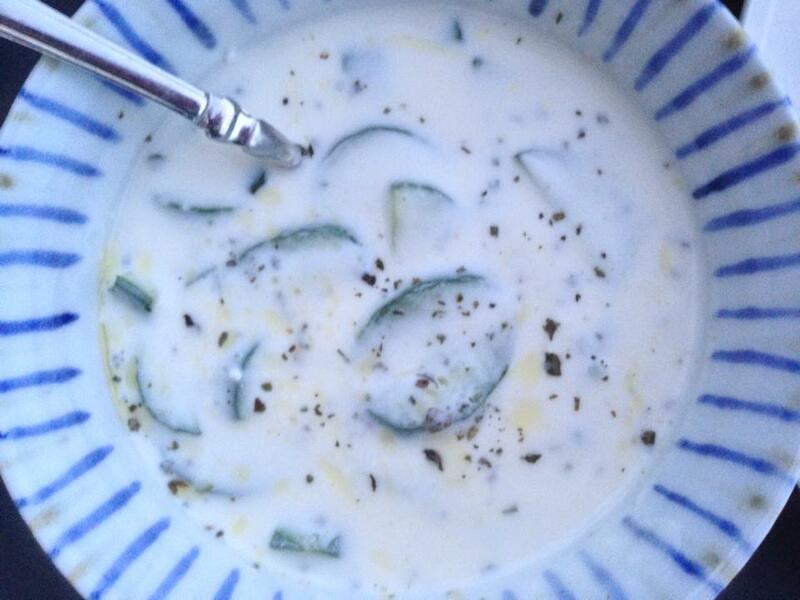 Add salt to taste and crushed garlic and mix well together, then add the sliced cucumbers. Finish by sprinkling dried or fresh mint on top and a thin drizzle of virgin olive oil. Serve in small individual bowls to be consumed on the side or to be placed as required on the plate next to the rice. Tags: chicken, cleaneating, culture, food, glutenfree, healthy, inspiration, Lebanese, life, salad, yoghurt. Bookmark the permalink. Thanks you 🙂 great, this is a family favourite recipe. We are fond of Lebanese stuffed cabbage rolls and kibbe that my husband’s grandfather taught me to make.